Asmech Systems Ltd in association with UV Technology Ltd reveal their latest UV Sausage Decontamination Tunnel. 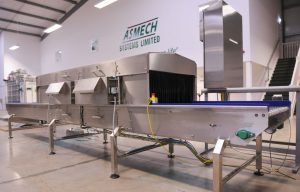 Asmech were responsible for the design and manufacture of this decontamination conveyor to transport sausages between a decline conveyor and a loading machine. The conveyor used 4 UV-C cassettes to decontaminate the sausages. The conveyor was manufactured from stainless steel and featured an Open Mesh Stainless Steel Wire Belt and SEW Geared Motor unit. THE UV SPECTRUM – UV-A, UV-B, and UV-C are all part of the ultraviolet light spectrum. UV-A results in skin tanning and is used in medicine to treat certain skin disorders. UV-B has a very high penetrating ability and results in sunburn. Prolonged exposure is responsible for some types of skin disease, skin ageing and cataracts. UV-C has extremely low penetrating ability and is nearly completely absorbed by the outer, dead layer of skin where it does little harm. UV Technology Limited make use of the bactericidal effect of UV-C light in the form of UV-C disinfection. Ultraviolet light in the C spectrum (UV-C) is energy-rich light with a wavelength of 200 – 400 nanometres (nm). UV-C light is very versatile and can be used for disinfecting water, destroying harmful micro-organisms in other liquids, on surfaces, on food products and in ‘air’. With UV-C technology it is possible to destroy more than 99.99% of all pathogens within seconds, without addition of chemicals, without harmful side effects, inexpensively, highly efficiently and reliably. Micro-organisms are microscopically small. They are everywhere and have an extremely high metabolism. For example, in hot and humid weather the number of moulds and bacteria increases exponentially. Furthermore, micro-organisms produce mucus substances that are deposited on surfaces and can contaminate food and cause microbial decay of the products. The cell nucleus of micro-organisms contains thymine, a chemical element of the DNA / RNA. This element absorbs UV-C light at a specific wavelength of 253.7 nm and changes to such an extent (formation of thymine dimers) that the cell is no longer capable of multiplying and surviving. This process has a lethal effect on all microorganisms such as bacteria, fungi, moulds, yeasts and viruses. Germicidal UV has been used safely and effectively in industry, healthcare, institutions & commercial / domestic premises for more than 100 years. UV-C light in the form of germicidal lamps has been used since the late 1800s to kill the types of microorganisms that typically cause indoor air quality (IAQ) problems – bacteria, mould, yeast and viruses. Niels Ryberg Finsen (1860-1904) was the first to employ UV rays in treating disease. He was awarded the Nobel Prize for Medicine in 1903. He invented the Finsen curative lamp, which was used successfully through the 1950s. UV-C was used to disinfect the municipal water supply of Marseille, France, in 1908. Westinghouse developed the first commercial UV-C germicidal lamps during the 1930s. They were used primarily in hospitals. After World War II, UV-C was used for sterilizing air in hospitals, kitchens, meat storage and processing plants, bakeries, breweries, dairies, beverage production, pharmaceutical plants and animal labs – anywhere microbiological contamination is a concern. During the 1950s UV-C was incorporated into air handling equipment. It became a major component in the control and eradication of tuberculosis (TB). During the 1960s, concern about microbes decreased with the introduction and increasing availability of new drugs and sterilizing cleaners. The energy crisis of the 1970s sparks enthusiasm for conservation. To save energy, heating, ventilating, and air-conditioning (HVAC) systems were shut down when not in use. Condensation that had previously been evaporated by the constantly moving air collected on coils and in the drain pan. Mould and other microorganisms multiplied in this dark, wet environment. When the systems were re-started, microbial contaminants were circulated throughout the building. 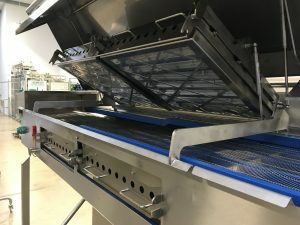 Recent technological advancements have made it possible for UV-C disinfection technology to deployed in an ever-expanding field of applications.